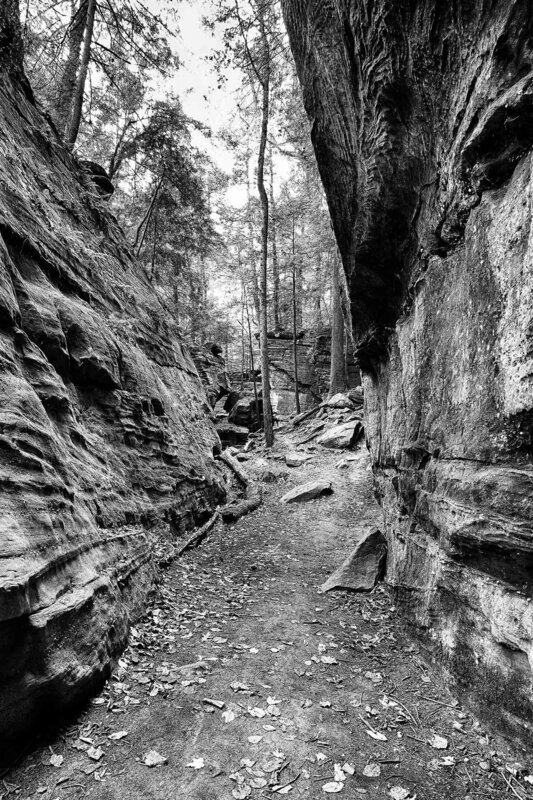 Yea, I know the title is not very specific, but I spent a few hours on this snowy day editing some photographs from adventures my wire and I took around Ohio this past Fall. Nickle Plate Road Steam Locomotive No. 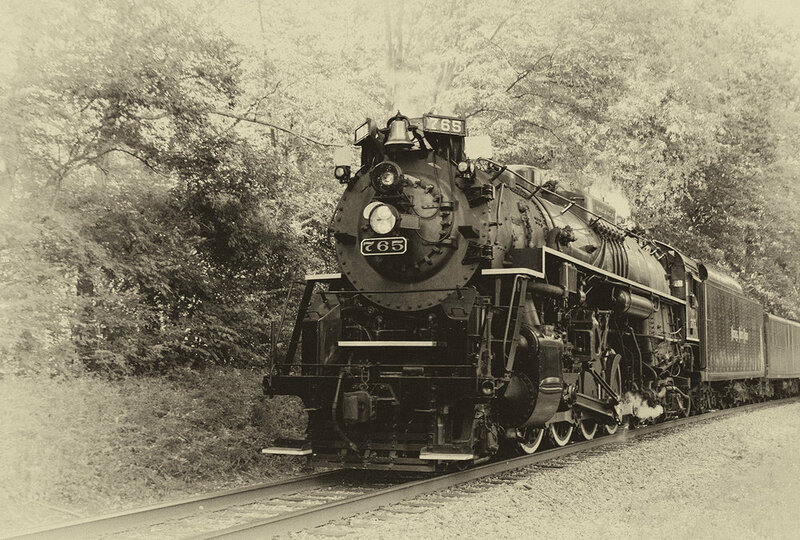 765 on its way through the Cuyahoga Valley National Park during the 2018 steam in the valley event. you can sure feel the heat of the locomotive as it went past us. More information on this fine machine can be found here. My wife and I went to a fall festival at an Amish farm which also had an zoo on the property. The fence and homes against the clouds in the sky really caught my eye. 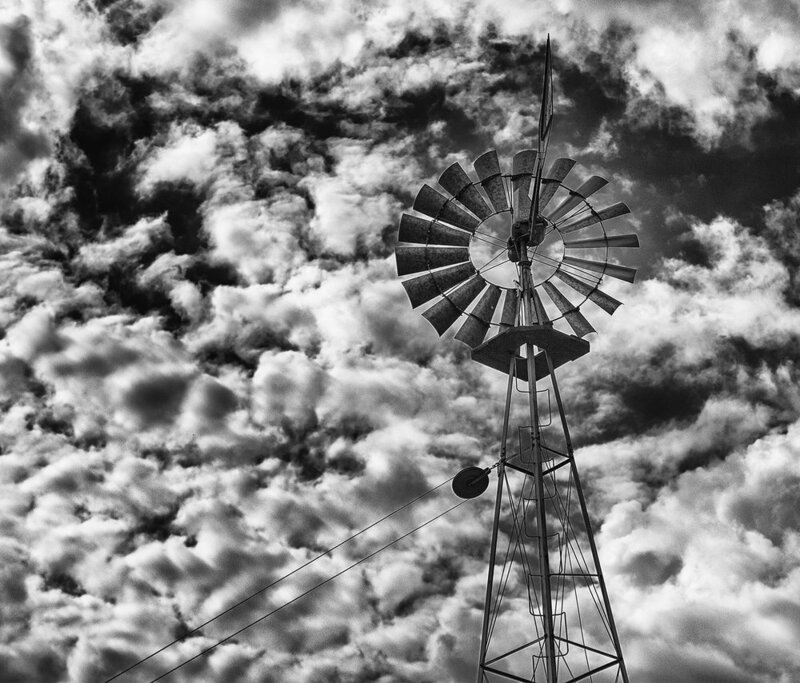 The windmill against the clouds caught my eye. 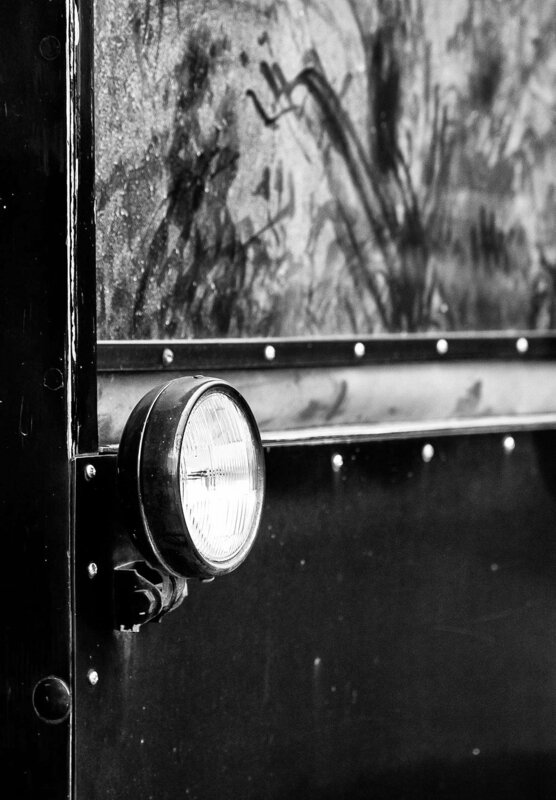 Headlight on an Amish buggy. I know it is only a few photographs with no story, but I hope you enjoyed them. Thanks for taking a look. I am finally getting around to writing my next blog of my last photo adventures. After the August photo adventures with James and “The Boy”, James and I discussed about getting together again in the Fall and including Dave D. James and Dave D. found a slot in their schedule that worked for all of us and we got together at the end of October. We planned the date in hopes of getting to see some Fall colors in the Greater Cleveland area, but due to a warm Fall the trees were rather green and had not changed very much. We still managed to venture around to make some photographs. Below are some of the images I made over the day and a half we were together. Three exposure HDR process with Nik’s HDR Efex and converted to monochrome with Nik’s Silver Efex. Three exposure HDR processed with Nik’s HDR Efex and Silver Efex. Three exposure HDR, processed the same way as the others. 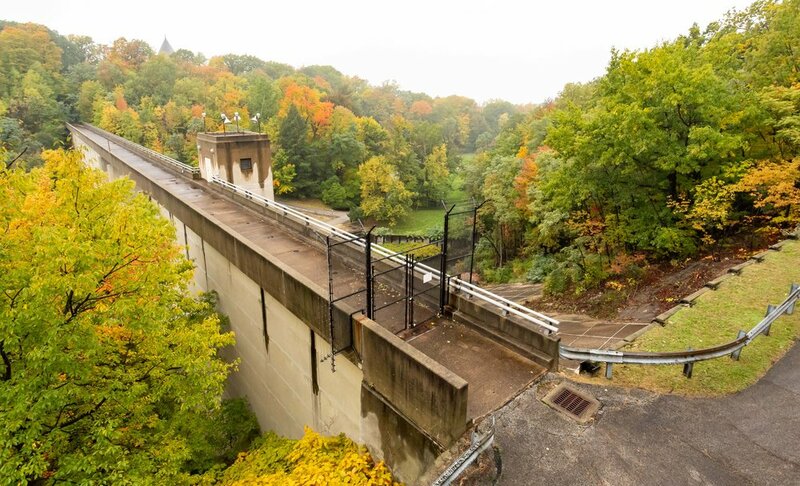 The largest dam in Cuyahoga County and is capable of holding up to 80 million gallons of storm water. It was a fun day and a half hanging out with a couple of good friends and I can’t wait to do it again. Thanks for viewing my photographs. Well the second day of my adventures with James was at the old Ohio State Reformatory or the Mansfield Reformatory. We were a part of the Cleveland Photographic Society all access tour that allowed pretty much access to all the areas within the reformatory for four hours before they opened to the public. The place was large and it is hard to believe that it only closed down in 1990. Also take note this is where the movie The Shawshank Redemption was filmed in 1994. Below are some of the images I made during our four hour tour. This a three exposure HDR processed with NIK HDR Efex and Silver Efex. I was fortunate to make this image prior to other photographers lining up to make their own or before the public lined up to wait to get in. Used my off camera flash overhead to fill the cell with light. Set my off camera flash inside the dark cell to light it up on the outside. Had to try this a few times since in the beginning there were many photographers on each level. Used my off camera flash to fill the wall with light so I could see the building on the outside. 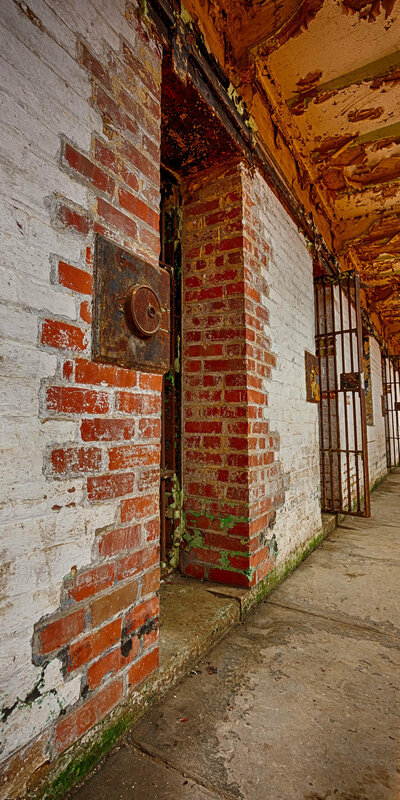 I set my off camera flash on the outside of the dark cell to light up the cell and get the shadows of the bars. My friend James was nice enough to hold my off camera flash inside a cell in a solitary confinement cell and shut the door to get the shadows of the bars on the outside on the floor. I set my off camera flash on a shelf above the cell window to fill the cell with light so I would maintain the balance of the ambient light on the outside and get the details on the inside.